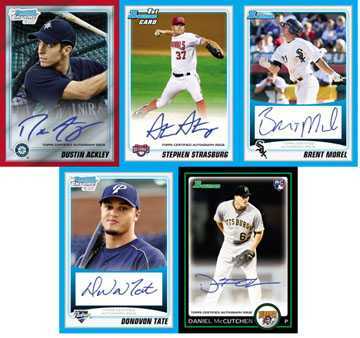 Here's a rundown of the cards I am looking forward to most in the upcoming 2010 Bowman Baseball. Hopefully this will help you pass the time until Bowman releases later this week. There are 15 Base Set Autographs, 12 Retail-Only Prospect Autographs, and 31 Bowman Chrome Prospect autographs. Base cards are base cards, but this year there's a certain rookie named Jason Heyward. Even better, I believe this is Heyward's first card to carry the official "RC" tag! This card should be one of the more exciting base rookies in recent memory, especially when you factor in the parallel potential. The "1st Bowman Card" of Strasburg and Ackley! An added Bonus is that Aroldis Chapman's card will carry the same distinction, as his 2009 Bowman Cards were considered part of the World Baseball Classic set and he was not a Major League Player at the time. 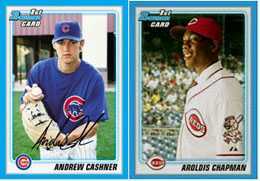 Jason Heyward, Mike Stanton: four of the most beautiful words in sports cards! Each triple relic card will also be numbered to 99! I left a few big names like Jesus Montero off the list, simply because he has a ton of cards in circulation already. Here's a little secret, Montero isn't the future backstop of the Yankees, it's Austin Romine, a fellow Yankees farmhand. This was a really cool idea. 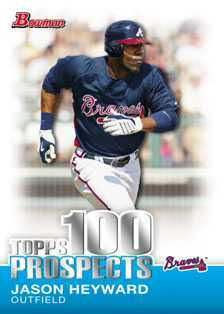 Basically, Topps ranked their Top 100 prospects and made an insert set out of it. When ranking them, I used the same principle that I used with the Relic rankings, favoring guys who have less cards in circulation whenever possible. Cool idea, but I feel like these are going to be plentiful and get old real fast, but I don't think there's a product in history that doesn't have one of "those" inserts in it. I basically ranked these based on some of my favorite players. These are essentially a "now and then" themed insert. 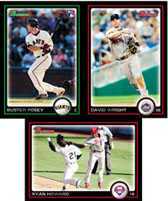 My Favorite combo was the Mauer/Posey. One combo I would have loved to see is Griffey/Heyward. This might be Griffey's last season and it's Heyward's rookie season, that would make for an awesome crossroads combo! Man, it is nice to finally see USA Baseball in Bowman! Future Washington National Bryce Harper is the obvious attraction in this insert set. For some reason, I am drawn to SS Manny Machado. Also, wouldn't it be cool if they did a Latin American Prospect subset to accompany the USA set? 2010 Bowman Draft BDPP107 Nelson Rodriguez 26 count lot, 9 chrome,17 base U.S.A.